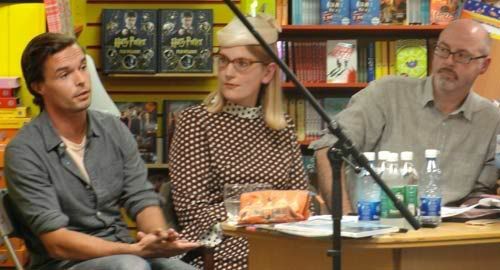 catherine & i rock dublin with oliver jeffers & pj lynch! 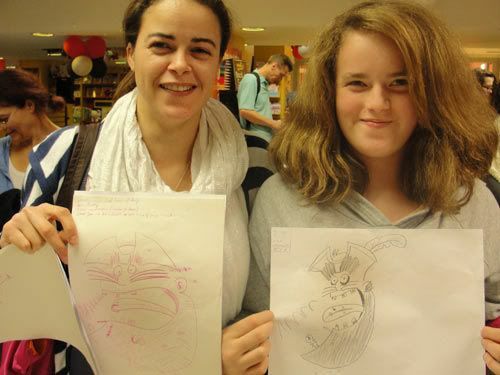 My fabulous Scholastic UK publicist Catherine Alport and I took our pirates to Dublin and had such a swashbuckling adventure! 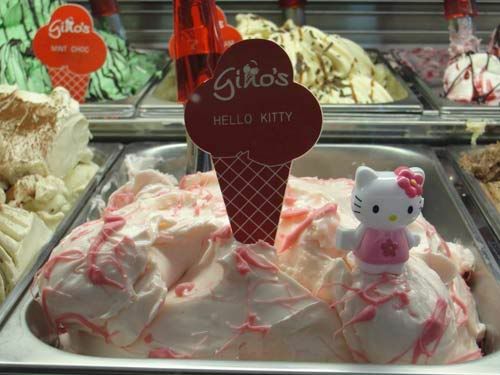 Did you know that in Ireland you can get gelato that's flavoured with puréed kittens? 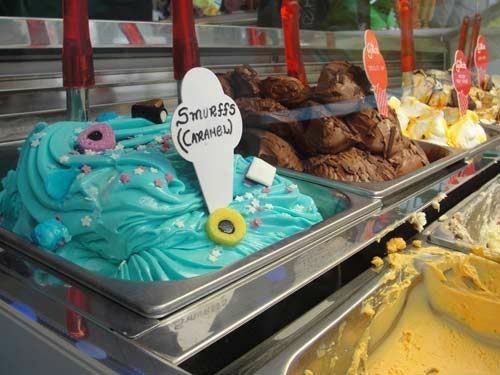 Or how about chopped-up Smurfs? We were shocked but intrigued. 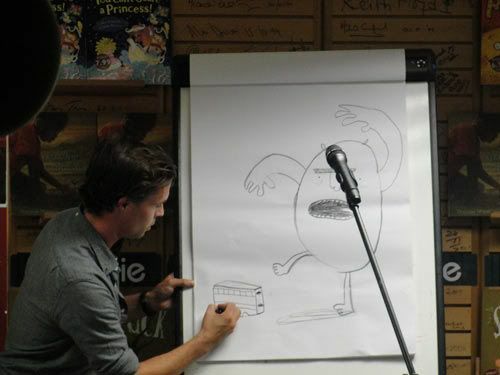 Having feasted on such strange iced delights, we met up with two marvelous illustrators: Oliver Jeffers and PJ Lynch. 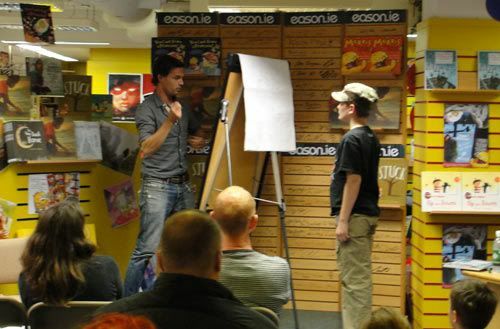 Here we are at Eason's big flagship bookshop on O'Connell Street, talking very seriously about illustration. Oliver also keeps a very serious book of LISTS. 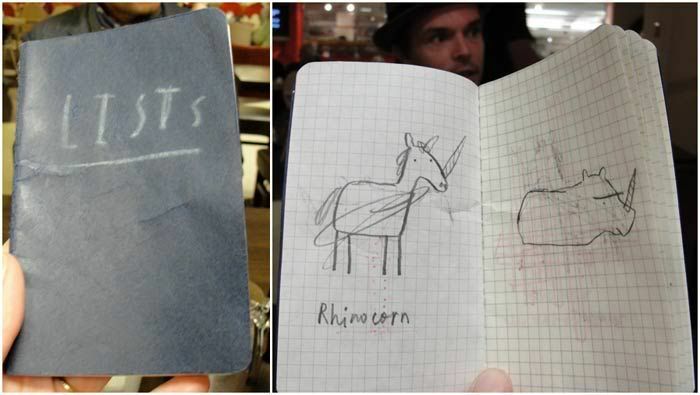 Next time he goes shopping, he will remember not to come home without a Rhinocorn. 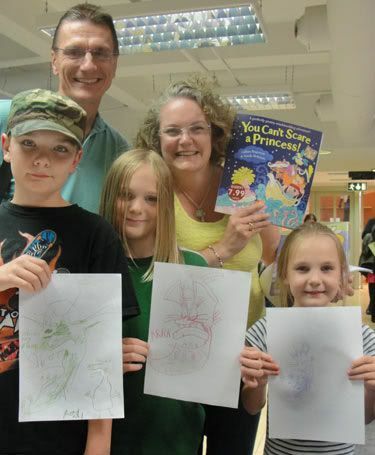 I was challenged to direct the audience in drawing one of my characters, so I showed them how, in stages, to draw Captain Waffle from my new picture book, You Can't Scare a Princess!. 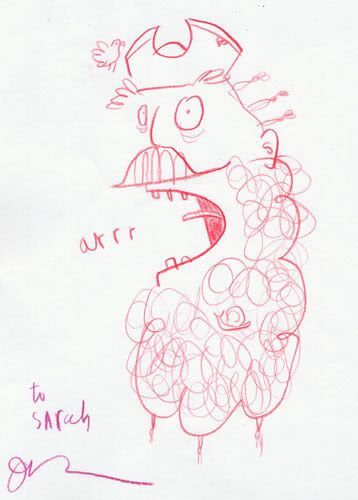 Here's Oliver Jeffers' version of Captain Waffle. I didn't really give him the choice of keeping it, but I did get him to sign his picture. Here's Oliver making a portrait that came out curiously looking like a giraffe. 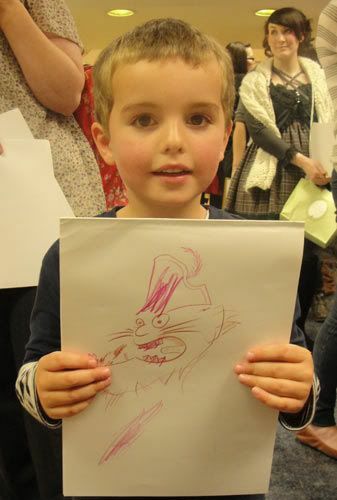 To show the audience what they can do with scale, Oliver asked the audience what he could put next to his monster to make it look very big. Someone suggested a double-decker bus. 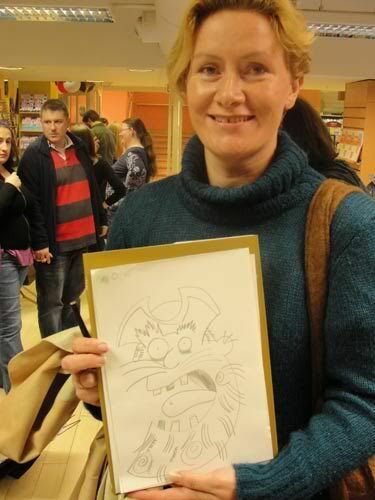 Both Oliver and I drew very doodly stuff, whereas PJ draws much more carefully and realistically. 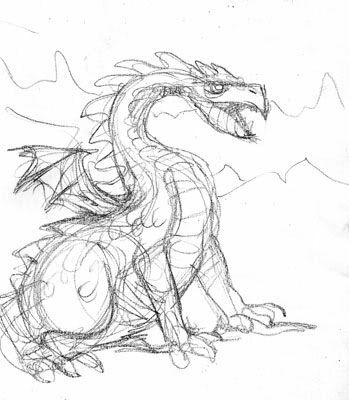 He showed us how to draw a fantastic dragon. 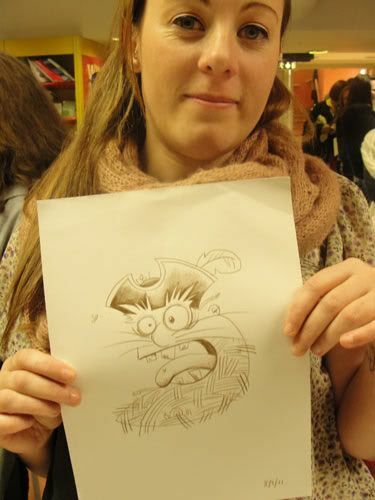 People really got into the swing of drawing Captain Waffle! I was thrilled to see how well their pictures came out. I love how everyone's is a little bit different. Here's David Maybury, Inish magazine editor and part of Children's Books Ireland, who hosted my visit to Ireland with Gary Northfield last year. 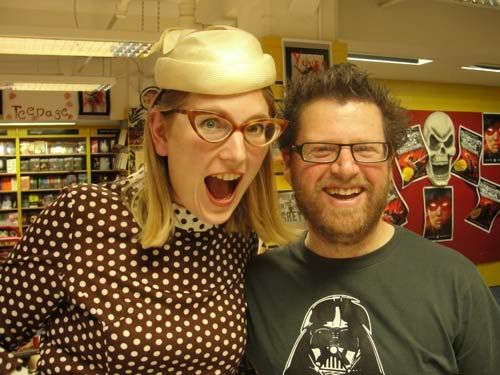 Note Captain Waffle's fabulous specs. 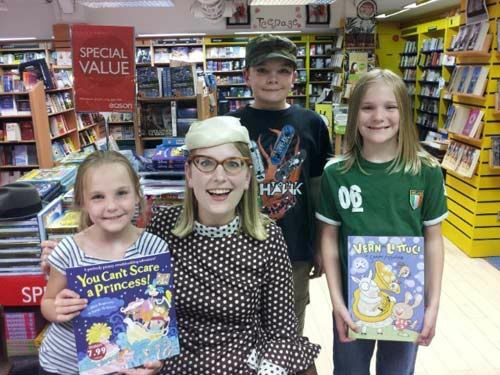 Thanks so much to Eason bookshop for hosting! 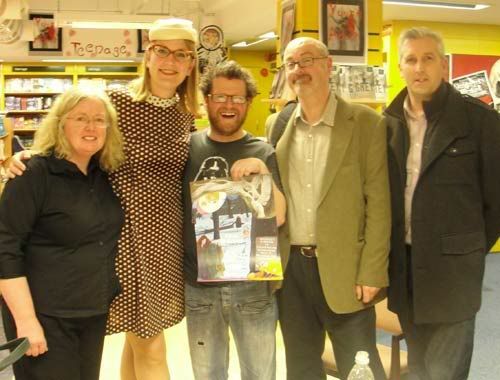 Here's Shena, who helped us set up, along with buyer Dave O'Callaghan, PJ Lynch and Walker Books/ HackettFlynn rep Conor Hackett. And a lovely picture, sent to me from my aunt in Seattle from the Ramos family! We had a fab sushi dinner by the river at Yamamori Japanese restaurant. The CBI team are such a good laugh! Here are Jenny Murray, Catherine, then David, David's partner and Aoife Murray. Now, it's always interesting to see behind the scenes. 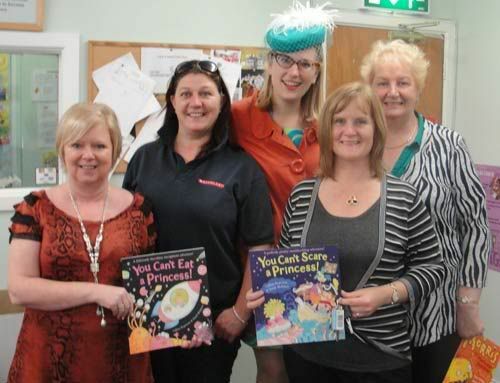 Children's books are so jolly and brightly coloured that you'd expect them to be delivered by fairies and pirates, not passing through a rather grey industrial estate. 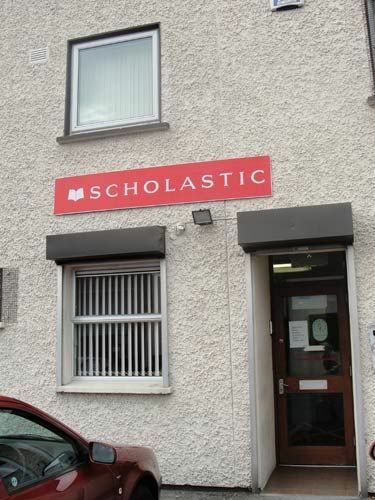 But indeed, they do, here's the hub for Scholastic's book club, which Catherine and I visited the morning after our Illustration Evening at Eason's. The setting may be a bit drab, but the team inside are exploding with energy and good fun. The two ladies in front came along with us two our two school events, Carol Martin on the far left (who'd come all the way from Belfast) and Dolores McManus, second from the right. 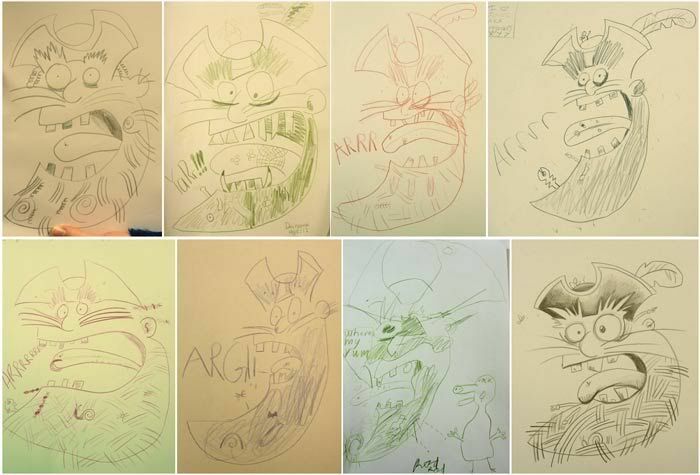 I didn't manage to get hardly any photos at either school, Maynooth Boys National School or St Brigid's National School, and we're not allowed to take photos of the kids, but wow, we had a stonking good time making pirates. I came out totally inspired, and hopefully the kids did, too! 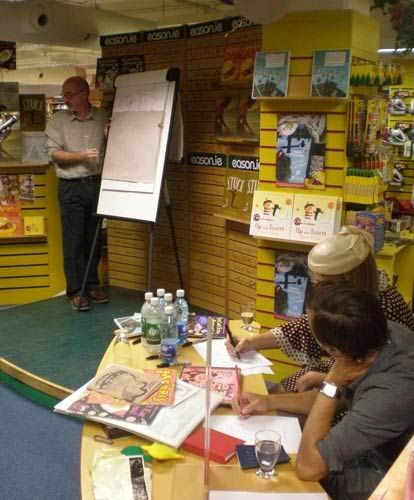 I didn't get to take photos of their drawings, but I'm hoping they'll e-mail some of them to me. 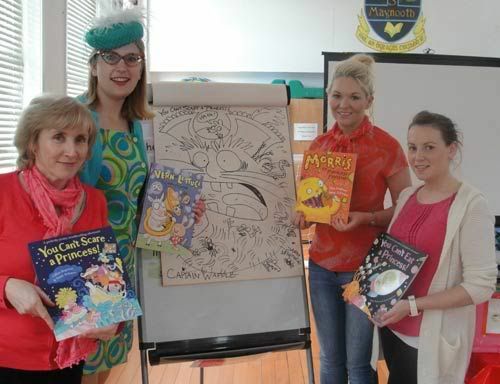 Possibly they don't get many big hats and go-go boots in Irish Catholic schools. I first noticed this when we walked into reception at St Brigid's and a women at reception took one look at me, gaped, and said, Good Lord, what's this?!! Ha ha... It's fun to make a big impression. 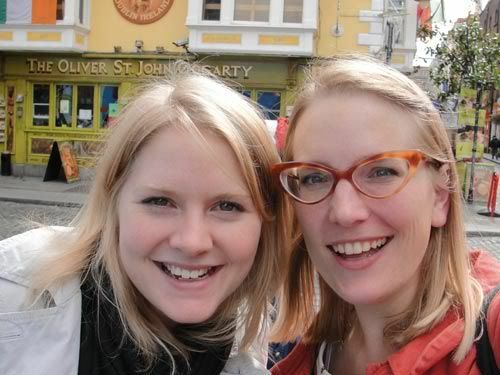 And then Catherine and I crashed at the airport, having blitzed Dublin and had a brilliant time. Thanks so much for looking after me, Catherine! That woman is so organised; you should see her itineraries, they are works of art. 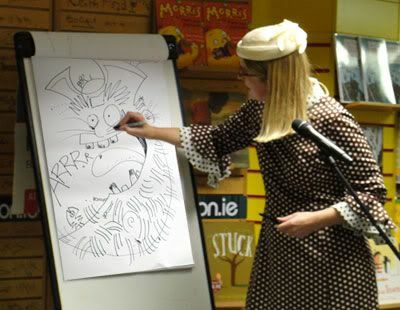 You can see some more photos of the Illustration Evening over on the Hackett|Flynn Publishers' Agency blog here! 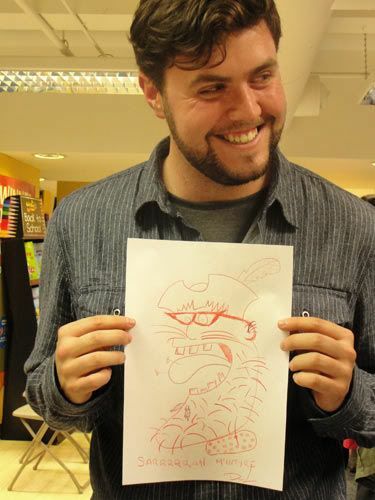 Oh, and Conor blogged about Morris the Mankiest Monster over here!